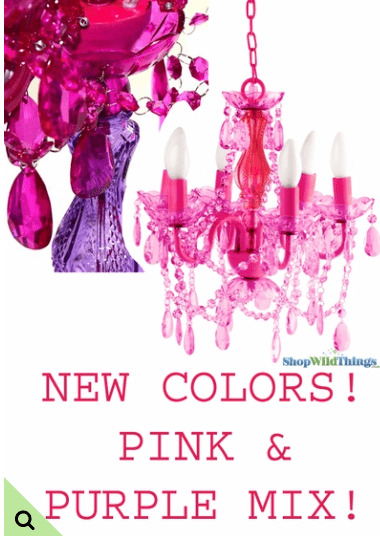 Our Small Posh Princess Gypsy Chandelier is a brilliant combination of purple and hot pink and this chandelier is absolutely awesome! The main photo that shows the whole chandelier shows the ALL PINK version. We are now only getting this with a mix of Purple glass pieces in the middle that make up the body. If you look at the upper left hand side of the main photo, you'll see a close up of what the center of the body looks like. It's ADORABLE! We like it SOOOOO much more than the all-pink version. The Posh Princess Chandelier collapses for easy storage and transport, making it a favorite for event decorators. The body, beads and light cups are purple while the ceiling cap, chain and arms are hot pink. The two shades blend together beautifully and complement each other just right! 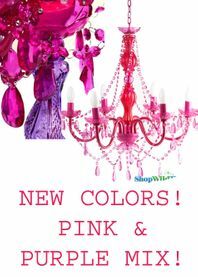 The Posh Princess chandelier will add class and intrigue to your home, event, or retail environment. Dripping with beads, this 6 arm chandelier is constructed beautifully using acrylic, glass, and resin. The chandelier body is 13" in diameter and 15" tall from the top of the body to the bottom hanging pendant. The hanging cord and chain, from the top of the body to the ceiling cap, is 24" long for a total hanging length of 39". The ceiling cap is 5.25" in diameter by 2.5" deep. Use six E14 bulbs, max 25 watts each (bulbs not included). These lamps are plug-in style but can be converted to hard-wire by a qualified electrician. This chandelier weighs just over 4 lbs.